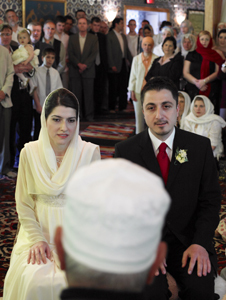 A traditional Muslim wedding held in New York. Agreement and payment of the mahr is an important part of an Islamic wedding. In the first era of Islam marriage was a simple affair, without pomp or ceremony. Any expenditure incurred in its performance was quite minimal, and not a burden on either family. Indeed, the Prophet stated: ‘the most blessed marriage is one in which the marriage partners place the least burden on each other.’ (al-Haythami, Kitab ab-Nikah, 4:255). Nowadays, much difficulty and hardship can be caused by the setting and giving of dowries, bride-prices and mahr – not to mention enormous wedding feasts and celebrations in some cultures which bring a most unreasonable financial burden on the families concerned. Financially crippling celebrations are totally in opposition to the spirit of Islam, and are not necessary. They are purely a matter of the culture of certain regions. No Muslim should feel obliged to continue these unIslamic traditions, or be embarrassed about breaking with their old cultural traditions. A Hindu wedding. The mahr in Islam is not the same as the Hindu bride-price or dowry. A ‘bride-price’ is either : · an amount of money, goods or possessions given to the bride by the bride’s family at the time of her marriage, in order to attract a good husband for her. It would in effect become the property of the husband or his family upon his marrying her. This is a totally unIslamic practice. In Islam, women are not ‘owned’ by their families and should not be ‘traded with’ in this manner. It is an insulting practice. Or · an amount of money demanded from the bridegroom or his family by the bride or her family, usually the bride’s father, without which the daughter will not be given in marriage. In the jahiliyyah society before Islam, this money was regarded as the property of the girl’s guardian. The matters of fathers giving the bride gifts of money or property, or paying for an enormous wedding feast, or providing a home, or setting her up in her home with furniture and household effects are left to the discretion of the people involved in Islam. The Prophet himself saw to the marriages of his four daughters. He gave his daughter Fatimah various gifts when she married Ali b. Abu Talib, but there is no record of his having given anything to his other daughters on the occasion of their marriages. Had such gifts been a recommended sunnah, he would surely have given the others gifts as well. Moreover, the gifts given to Fatimah were extremely modest household articles – a sheet, a leather water-bag, and a pillow stuffed with grass and fiber. Nothing could be more unIslamic than ostentation. It is ridiculous to attempt to justify flamboyant displays of wealth in lavish gifts or feastings by citing the Prophet’s extremely modest gifts to Fatimah. The mahr is a compulsory part of an Islamic marriage contract. The other words for mahr generally used in the Qur’an are sadaqah and ajr, meaning reward or gift to the bride in which there is profit but no loss, and faridah, literally that which has been made obligatory, or an appointed portion. Allah commanded: ‘Give women their faridah as a free gift.’ (4:4) (Unfortunately the word is frequently incorrectly translated as ‘dowry). It is a gift of money, possessions or property made by the husband to the wife, which becomes her exclusive property. It is an admission of her independence, for she becomes the owner of the money or property immediately, even though she may have owned nothing before. It has nothing to do with either of their parents, except that a husband might need to take a loan. This should only be done with the intention of repayment. It is also intended as a token of the husband’s willing acceptance of the responsibility of bearing all the necessary expenses of his wife. The Prophet gave each of his wives a payment of mahr, ranging from token sums, the granting of freedom from slavery when being made a wife, to the payment of 400-500 dirhams. His wife Umm Habibah’s mahr consisted of 4000 dirhams, this sum having been fixed by Najashi, the Negus (a Christian ruler) of Abyssinia. (Abu Dawud, Kitab an-Nikah, 2:235). ‘…the wealthy according to his means, and the straitened in circumstances according to his means. The gift of a reasonable amount is necessary from those who wish to act in the right way.’ (2:236). In a famous case, the second Caliph, Umar b. al-Khattab, once gave a public sermon in which he asked the congregation to refrain from fixing heavy mahrs, and stated that the Prophet had declared no-one should give more than 400 dirhams. A woman immediately stood up and challenged him, quoting the verse 4:20 from the Qur’an: ‘But if you decide to take a wife in place of another, even if you had given the first a heap of gold (quintar) for a dowry, you shall not take the least bit back.’ Umar went back to the minbar and withdrew his words stating ‘the woman is right, and Umar is wrong. Whoever wishes may give as much property as he wishes to give.’ (Ibn Hajar al-Athqalani, Fath al-Bari, 9:167). A Muslim bride signing the Islamic marriage contract. The mahr can be specified in the contract, and is generally paid at this time. It is a gift of money, possessions or property made by the husband to the wife, which becomes her exclusive property. The mahr is owned solely by the wife. The husband is not allowed to refuse to pay his wife a proper mahr or faridah. The settling of the payment is obligatory. ‘Women are lawful to you….provided that you take them in marriage and not fornication. As to those through whom you profit (through marriage), give them their faridah as appointed.’ (2:24). The same applied when marrying Jewish or Christian women (5:5). If a Muslim man married someone ‘whom his right hand possessed’ (ie a slave or prisoner of war), the mahr was to grant her freedom and other payment was not required. The case of a woman whose husband died before fixing the amount of the dowry or consummating the marriage was brought to Abdullah b. Mas’ud. He ruled that she should be paid according to the mahr of women of like status to herself. The Shafi ‘I school rules that a wife may refuse to consummate the marriage if the husband agreed to pay the mahr immediately, but did not do so. She may have the marriage annulled. It is unIslamic for a Muslim woman to set a huge demand for herself, with the intention of deterring suitors of humble means. Islam does not require husbands and wives to come from the same social strata or income brackets – although this may often seem to be advisable. Islamic compatibility is based on religious faith and mutual respect, not on money, caste (another Hindu custom), class, background, nationality, etc. It is just as unIslamic to demand a huge mahr, generally beyond the husband’s means, based on the intention of checking the husband from ill-treating his wife, or wrongfully or causelessly divorcing the wife, or preventing him from remarrying another later – the reasoning being that in cases of divorce the woman can demand the full payment of the mahr. The fixing of a substantial mahr for the above purposes rests on the supposition that the mahr has to be fixed at the time of marriage, but not handed over until divorce – which gives it a supposed ‘deterrent’ value. This is unlawful in Islam, for in this case the wife has no use or ownership of the mahr during the time of the marriage. If the prospective husband is not a wealthy man, a generous wife may choose to accept very small mahr, but this has to be her own free choice. She should not be coerced or have pressure put on her in any way. Some of the Prophet’s female companions accepted their husbands’ conversions to Islam, or memorising of ayat of the Qur’an, or giving education to others as their mahr. The mahr has to be fixed taking into account the bridegroom’s position in life. That is, it should not normally be more than he is easily able to afford, whether it be a lump sum or some article of value. Jurists have different views on what the minimum amount should be, but all agree that it should be substantial enough for something to be bought against it. In other words, any amount which is sufficient for a purchase is acceptable as mahr. The husband may be loaned money by his father or family, but it must be repaid. In the case of Nabi Musa (the Prophet Moses), when he left Egypt for Madyan he married Safura the daughter of the Prophet Shu’ayb. His mahr mu’ajjal was settled and paid off by binding himself to grazing his father-in-law’s cattle for ten years without wages. Presumably Shu’ayb had paid Safura on Musa’s behalf. A good woman might agree on a low mahr if she wishes, or none at all, according to the circumstances of her husband. Once fixed it is fixed, and legally binding – so it is good practice to have it written down and witnessed on a document. The wife should take advice on her decision, and not be blinded by emotion, or coercion, or fear, or family pressure. If any person pressurises a woman into a decision she might not have otherwise made, that person will be held to account in the Life to Come, even if he ‘got away with it’ on this earth. One recorded hadith suggests that ‘the best woman is the one whose mahr is the easiest to pay.’ (al-Haythami, Kitab an-Nikah 4:281). The first way is to hand it over in full at the time of marriage, in which case it is known as mahr mu’ajjal, or ‘promptly given mahr’. (Notice the ‘ . The word is derived from ‘ajilah, meaning ‘without delay’. This was the accepted practice during the time of the Prophet, and the amount fixed was generally quite minimal. The second way of presenting mahr is to defer it, to hand it over to the bride after a certain period of time, the duration of which must be specified, fixed by the man and agreed by the wife. This has to be settled, with witnesses, at the time of the marriage. This form of mahr is known as mahr muwajjal. (the word implies ‘in a period of time’). This method should never be used as an excuse to willfully postpone the payment. A definite date should always be fixed, witnessed, and adhered to. It should certainly not be left ‘hanging’ in case the marriage breaks down and the couple come to consider a divorce – because of the inevitable emotions, bitterness, arguments, hostilities and financial problems involved at that time. If the wife does have genuine grounds for divorce – such as cruelty, mental cruelty, breaking of the marriage contract, adultery, desertion, incurable insanity, long-term imprisonment, abandonment of Islam – then the divorce is not khul but a normal talaq, in which the wife has as much right to instigate proceedings as the husband. In these cases, she most certainly does not have to hand over any of the mahr. If the wife has genuine grounds for divorce but the husband refuses the divorce, she may then approach lawyers for khul, and appoint an Imam to act for her. It is sensible to do this as well as having a UK lawyer. She is not required to pay back any of her mahr. Indeed, the lawyers may demand some further compensation for her if the husband is guilty. (She may have to prove his guilt, and should gather as much evidence beforehand as she can – such as signed and witnessed statements of witnesses, photographs of injuries sustained, etc). English convert to Islam, Ruqaiyyah Waris Maqsood, is the author of over thirty books on Islam and other subjects.